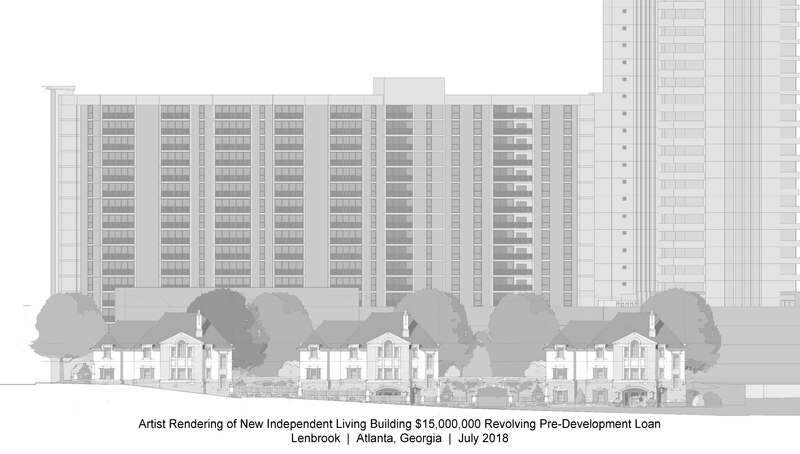 Lenbrook: A Life Plan Community in Atlanta, Georgia, consisting of 353 independent living residences, 60 Medicare-certified skilled nursing beds and 16 personal care suites sought financing to bridge pre-development costs in connection with a campus expansion project. After a successful refinancing in 2016, management of Lenbrook teamed up with HJ Sims to solicit commercial lending partners to assist them in meeting pre-development capital demands while managing cash flow. As an investment grade rated credit, Lenbrook has significant cash resources but wanted to manage its cash utilization for pre-development costs. – Identifying a partner that may participate in the expansion project once fully under way. – Providing flexibility to allow Lenbrook to utilize its cash resources for some pre-development costs while minimizing the overall impact to Lenbrook’s balance sheet. Sims coordinated a bank request for proposals process that was widely distributed to prospective commercial lending institutions and facilitated site visits for prospective lending institutions resulting in a number of attractive proposals. Sims further coordinated the financing process with the selected lender, SunTrust Bank, Lenbrook and their legal teams to drive the transaction to close on time. Lenbrook was able to obtain a loan with a three year revolving loan feature that would fully amortize after the end of the three-year draw period for an additional 7 year period, or, at Lenbrook’s option and upon satisfaction of certain conditions, amortizing on a 25 year amortization schedule. The loan is also pre-payable at any time without premium and is anticipated to be prepaid with entrance fees generated from the expansion project. Lenbrook is an existing life plan community which consists of 353 independent living residences, 60 Medicare-certified skilled nursing beds and 16 personal care suites. Lenbrook is located in Atlanta, Georgia, in the affluent Buckhead neighborhood. Lenbrook opened its doors in 1980 and conducted its initial campus expansion in 2006. As of March 31, 2018, Lenbrook’s current average occupancy across all levels of care is 93%, including 95% in independent living. Given the demand for independent living units on Lenbrook’s campus, as well as its desire to expand options available to its residents, provide safer and more convenient egress from the Community, increase parking, and protect current views, Lenbrook has embarked on an expansion and repositioning project. The 53-unit independent living expansion will include 14 villa-style apartments as well as 39 apartments, with an average size of 2,100 square feet, an underground parking garage, additional greenspace and community space, and a traffic light to facilitate residential egress from the community. Furthermore, the restructuring of Lenbrook’s existing indebtedness in 2016 through the use of tax-exempt fixed rate bonds (the “Series 2016 Bonds”) generated cash-flow savings to facilitate the first in a series of land purchases adjacent to Lenbrook’s existing community upon which the expanded project is expected to be situate. Prior to the construction and permanent financing of the proposed project, Lenbrook expects to incur pre-development costs up to approximately $15,000,000, which it desired to fund through a revolving construction loan. These pre-development costs will primarily fund land acquisition, the marketing activities related to pre-selling the new independent living apartments as well as design-development and other development-related activities. Since the pre-development loan was to be secured on a parity basis with the Series 2016 Bonds, Lenbrook was required to meet the additional indebtedness incurrence provisions under its existing Master Trust Indenture (“MTI”) prior to closing on the pre-development loan. On July 19, 2018, Sims facilitated the closing of the $15,000,000 pre-development loan, which was structured as a taxable revolving commercial loan (the “Series 2018 Loan”). The Series 2018 Loan was provided by SunTrust Bank and its Aging Services/Senior Living Industry Practice Group, which also expressed interest in the full-scale expansion financing. While it is anticipated that the Series 2018 Loan will be repaid from initial entrance fees from the new independent living units, the Series 2018 Loan was structured with a three-year revolving line of credit that will then amortize over a 7 year period following the initial draw period on either a 7-year or 25-year amortization schedule to provide additional flexibility for Lenbrook. In the unlikely event that the proposed project does not move forward by the summer of 2021, Lenbrook will have the flexibility to amortize its outstanding principal balance. This extended amortization period will enable Lenbrook to repay the pre-development loan from existing operations without compromising its ability to service its debt service on the Series 2016 Bonds and otherwise meet its financial covenants. For more information on how Lenbrook was Financed Right® by HJ Sims, please contact Aaron Rulnick at (301) 424-9135 or arulnick@nullhjsims.com, Melissa Messina at (203) 418-9024 or mmessina@nullhjsims.com, or Patrick Mallen at (203) 418-9009 or pmallen@nullhjsims.com.